Kaiju Big Battel, a series of live events that revolve around tournament-style performances, is a tongue-in-cheek hybrid of Japanese-monster-movie mayhem and lowbrow pop-culture. These sold-out events feature a roster of over thirty monsters battling in a modern conflict of epic proportions. Kaiju Big Battel, the official guide, will provide an overview of the Kaiju universe, principally the key monsters and the epic battles, for devoted fans and new readers alike. In addition to a 16-page full-color insert of Kaiju studio photographs and a glossary, Kajiu Big Battel will be ornamented with a safety manual, weapon profiles and a guide to the inner workings of the Kaiju world. 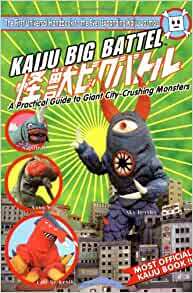 A crash course in everything Kaiju, readers would be well-advised to pay careful attention as those uneducated in monster mayhem could be imperiled next time Kaiju Big Battel erupts in their neighborhood! The Big Battel Rages on in the Kaiju Universe! "Kung-Fu Chicken Noodle couldn't wait for the ball to drop to avenge his shocking loss to the newest Kaiju Hero, RoBox, at Kaiju Rampage New York. As Louden Noxious counted down to the stroke of midnight, the killer klucker burst into the Danger Cage and began to lay waste to the snow-covered cityscape. Seeing this wanton destruction, newly constructed Kaiju Hero, RoBox rushed the Cage to put a shop to the terror. This was perhaps the robotic Hero's biggest mistake of the night. Fresh from an extended stay in China with his sensei, Mr. Wong, Soup unleashed a barrage of devastating new maneuvers upon Kung-Fu Chicken Noodle. High-flying flips and crushing corkscrews quickly overloaded RoBox's circuts and the new Hero was unable to mount any signifigant counter attack. Finally Soup delivered the Bouillion Back Flip for the pin, earning the right to fufill his new year's resolutions: to kill again!" Studio Kaiju is an independent Boston-based performance and media group as well as creator of Kaiju Big Battel, the world's only live monster mayhem spectacle. Producer of consistently sold-out events, Studio Kaiju is best known for its live tournament-style performances, which are a character-driven, tongue-in-cheek hybrid of American pro wrestling, Japanese monster movies, and lowbrow pop culture. These multimedia events, complete with oversized monster-movie props, a towering "Danger Cage," and miniature cityscape, can also be viewed from a safe distance thanks to the Kaiju Big Battel DVD series from Redline Entertainment. To fund its live event series, monster creations, and metropolitan destruction, Studio Kaiju produces and distributes its own line of merchandise, including T-shirts, "real" monster meat, magnets, and a whole catalogue of other cool but useless limited-edition collectibles. The world of Kaiju Big Battel is also supported by Studio Kaiju's acclaimed website, kaiju.com, which hosts Big Battel news, monster profiles, live event videos, arcade-style games, comics, and the most fun online mall ever. this told me everything there was to know about kaiju big battle world with great pics of all the monsters. I wanna go see it in person. This book is a clever parody of three silly genres all at once: Japanese monster movies, the Manga craze, and professional wrestling. Largely I think it works well as a satirical piece of humor and social commentary, but mostly it is just good old fashioned fun. The basic premise is that the evil Dr. Cube has created giant monsters that fight each other in the "Kaiju Big Battel" arena for entertainment of the masses. There are good and evil Kaiju, and some rogues that can change allegiances at the drop of a hat. The monsters here are not your typical Japanese Godzilla copycats, but rather creative originals such as Call-Me-Kevin (my personal favorite), the ridiculous looking Sky Deviler, and the heroic tuber, Silver Potato. The book is broken down into a biography section, a section of famous Kaiju bouts, and assorted other features such as "How Sky Deviler's Digestive System Works" and "Silver Potato's Holiday Miracle". There is even a color spread that has very amusing faux-Japanese translations like: "Who is the sphincter mouth of depth-perception irrelevant monster? Sky Deviler most high ugliness the dive bomb swoop. Special appetite skill combine with brain lentil size create the deadliest!" I found the book quite entertaining and diverting. I particularly love old Japanese monster movies, and seeing this pay homage to them while concurrently mocking Manga and wrestling made this book totally worthwhile for me. For fans of Godzilla's campy heart and professional wrestling's campy drama, this is a piece of gold. Even if you out grow one, chances are you'll love it. of course, it's great to share as well. Definitely gets you up to speed and explains the backstory. Wrestling, godzilla, manga hybrid live action show.